Early stained glass is quite rare in south Wales, particularly in comparison with north Wales, and many of the most notable stained glass in the region comes from overseas. It was with some surprise that, on a recent visit to a number of churches in Monmouthshire, I came across some sixteenth-century heraldic stained glass that I have not seen noted anywhere before. 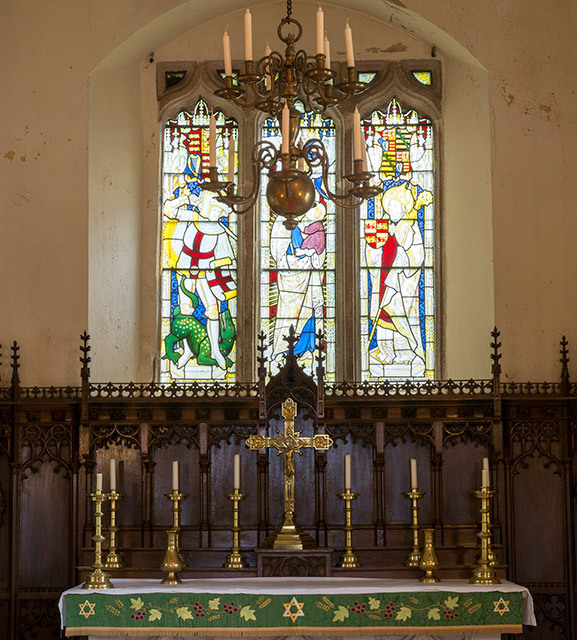 I arranged to visit the church to see its late nineteenth- and early twentieth-century stained glass, but was intrigued by some coloured and painted glass that I found in the chancel windows. 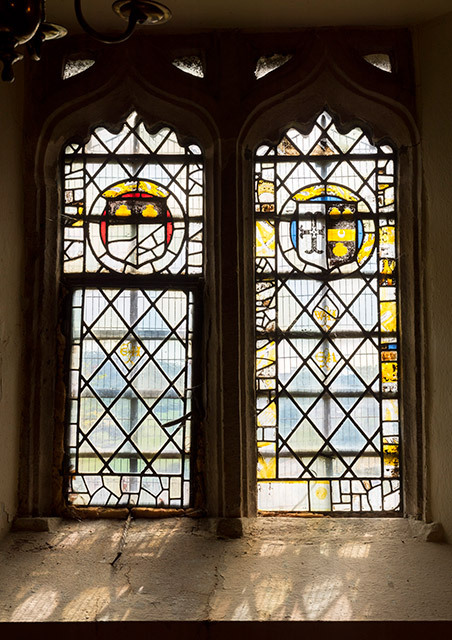 The two two-light windows both had roundels containing complete or partial coats of arms, with coloured and stained fragments around the borders. 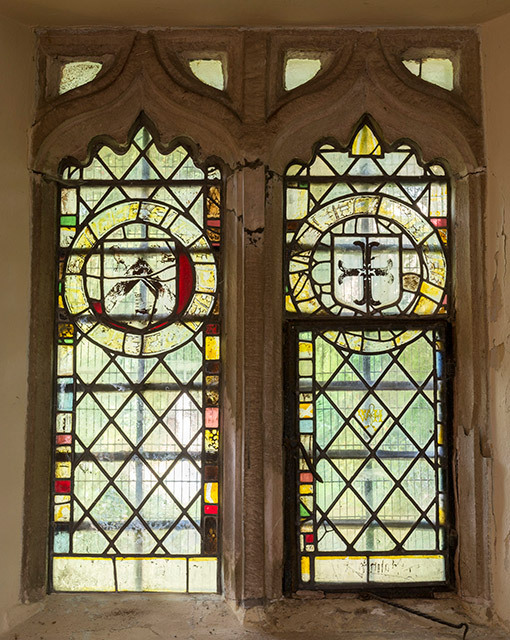 The window on the north side also had an inscription along the bottom, and although most of the paint has been lost, the ‘ghost’ of the letters was faintly visible. Sometimes early and mid-nineteenth-century stained glass can appear very faded as the paint sometimes deteriorates, and at the time, since I was not expecting anything so old, I wondered whether this was badly-fired nineteenth-century work. But the more I looked, I thought that there must be a good chance that this stained glass was indeed a few hundred years old, particularly given the way in which small parts of glass were leaded together in a rather irregular way. Nonetheless, the fact that I had not seen anything published about this glass weighed against such an assumption. It was not mentioned in John Newman’s ‘Pevsner’ for Gwent/Monmouthshire, and it is not included in Andrew Renton’s survey of pre-1700 stained glass in south Wales, published in Vidimus in 2009, although there are a few other omissions from this list that I have come across. Nothing about them was included in the notes on the building available at the church. On returning home I checked the Pevsner once again and found the CADW Full Report for Listed Buildings, neither of which mentioned any early stained glass at the church. I then had a look at Joseph Bradney’s multi-volume History of Monmouthshire, to see if it might help with the heraldry found in the windows. In the past I have found this work particularly unhelpful for researching stained glass, but in this instance he does mention some stained glass that was formerly at the church, lamenting that it had only very recently been removed from the church (the book, his first volume, was published in 1904). Argent, a cross moline quarter pierced sable; Sable, a fosse between three escallops or, a crescent for difference… got it? He describes the windows in heraldic terms, and it took me a little while to decipher the descriptions (e.g. Argent, a chevron sable between three ravens proper and Argent, a cross moline quarter pierced sable; Sable, a fosse between three escallops or, a crescent for difference), but the four descriptions match what is currently at the church very closely, suggesting that what was taken out in around 1903 has since been carefully restored. The glass was formerly in a three-light window, with a fourth heraldic roundel in a south chancel window, and it must be that the commissioning of the present east window (by Ninian Comper) displaced this pre-Reformation stained glass, which had no doubt hitherto been in its original position. At some unknown date, and possibly quite soon after the new east window was placed there in 1903, the glass was obviously carefully restored to the church: the three roundels from the east window joined by the one Bradney recorded in the south chancel window (but now in the north) in the north and south windows of the chancel. 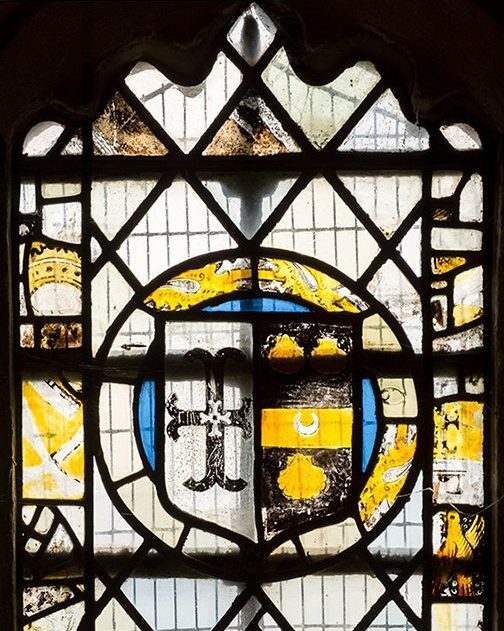 As well as identifying one of the arms as those of Elizabeth, wife of Sir Charles Herbert, Bradney also transcribes an inscription, which asks for prayers in favour of Sir Charles Herbert and his wife Elizabeth ‘qui hanc fenestram vitriari fecerunt’ (who caused this window to be glazed). I have not yet discovered the date of their marriage, which would give us an earliest date for the window, but Charles Herbert of Troy (1500–57) would have been unlikely to have placed the window much before 1520. The donor suffered a decline in fortunes in the later years of his life, and also remarried, so Bradney’s suggested date of about 1540 seems about right. The displeasure of an historian such as Joseph Bradney in learning of the recent loss of the windows is not unexpected. Nonetheless, these rather dilapidated reminders of sixteenth-century gentry patronage had probably outlasted their welcome for the congregation, who probably preferred the new modern pictorial window. At least Bradney’s worst fears turned out to be unfounded, and this important historical stained glass has continued to survive more than a hundred years since he pronounced it lost.